Please visit us in the Sheep Barn located across from the 4H Food Booth. 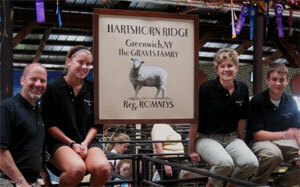 Hartshorn Ridge is a family owned and managed farm located in Washington County, New York outside the village of Greenwich raising quality breed stock Romney in addition to premium lamb. Hartshorn Ridge is named for the Hartshorn Creek, a tributary of the Batten Kill River, which runs through the farm. Greenwich is located within the Cambridge valley region in between the Adirondack Mountains and Green Mountain Range of Vermont and within 3.5 hours of Manhattan, Montreal and Boston. Our animals are raised outdoors, on pasture, eating natural grass and never given hormones or unnecessary antibiotics. These simple practices result in happy livestock, wholesome products and a greener environment for all. We are open year round by appointment.